There are new forms of gene therapy. Gene therapy’s been around for a long time but there are new techniques that can put the genetic information in the right place, at the right time. United Therapeutics  has an interesting technology that takes the cell in vitro, modifies it in vitro, and then you can inspect it and make sure that it got done correctly. Then you replicate the cell, re-inject those millions of cells back into the organism and they work their way into the right tissues, which in this case are the lungs, and it’s cured pulmonary hypertension - a fatal disease. They’ve done that in animal models. It’s now going into human trials. So there are many examples of being able to reprogram these information processes in biology. You can turn enzymes on and off via the expressions of genes. Pfizer’s Torcetrapib  turns off one specific enzyme at one specific stage in the development of arteriosclerosis, and the phase 2 trials showed it was very effective. They’ll be spending a record $1 billion in phase 3 trials, and there are thousands of developments like this. And any one of them is unpredictable to address. But the overall impacts of these technologies are remarkably predictable, really. I’ve been making predictions going forward, I’m not just looking at this data and over-feeding to back data, for a quarter century. 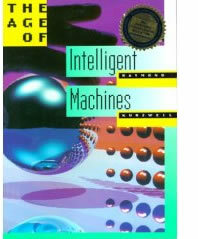 Image 4: "The Age of Intelligent Machines"
The first book I wrote, The Age of Intelligent Machines , written twenty years ago in the 1980’s, had hundreds of predictions about the 1990’s and early 2000’s, based on these models, which are quite accurate, and I’m not embarrassed about any of them. Some were a few years off. I was generally overly conservative because some outlier- like Novamente - makes some breakthrough and things happened a little bit more quickly, that’s what happens. In the mid-80’s I predicted the emergence of a worldwide communication network because I saw the ARPANET  doubling every year. It was 10,000 nodes going to 20,000 nodes, and it wasn’t on anybody’s radar map. But doubling every year is multiplying by a thousand in ten years, so I figured in the mid-1990’s it would be ten million going to twenty million and then forty to eighty million- it would be a worldwide phenomenon, and that is what we saw. I predicted that for 1995 or 1996, and it happened in 1993 to 1994, and that progression was very predictable. But if you double one percent seven more times you get 100 percent and that is exactly what happened. And that has continued since that time. If you apply this to other types of data, to the Proteome Project  and so on, you’ll see the same kind of exponential progression. When you can measure the information content of a process, we find these very smooth exponential progressions. We find a doubling time of 11, 12, 13 months, depending on what you’re measuring. The same thing’s true with the brain. Spatial resolution for 3D volume brain scanning is doubling every year. The amount of data we’re collecting on the brain is doubling every year. We’re also showing that we can turn this data into working simulations. Let me quickly go through a few dozen examples of just how pervasive and predictable these exponential trends are and how we can use them to make useful predictions. Exponential growth is seductive and surprising. It’s smooth, there are no discontinuities. 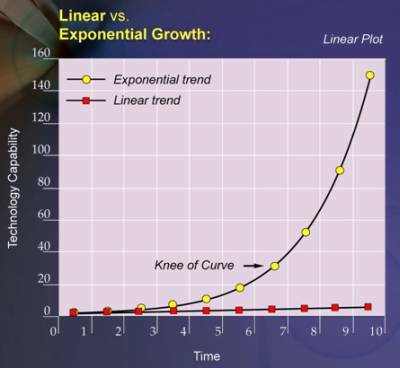 I sometimes refer to the ‘knee of the curve.’ It’s been pointed out that exponential doesn’t have a knee of the curve as it’s mathematically identical. 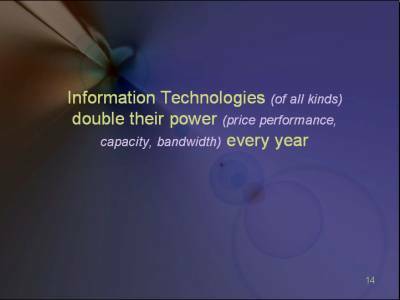 But it does make a difference in terms of its impact whether you’re doubling a thousand nodes on the ARPANET or 100 million nodes on the internet, if it gets to a point where it has real traction and makes a dramatic difference, and I’ll show you many examples of that. I have a whole theory as to why that is the case. In fact, the paradigm shift rate is doubling ever year: the rate of technical progress is itself not a constant. I was at the 50th anniversary of the discovery of DNA and all of us speakers were asked, ”Well, what will the next 50 years bring?” And every speaker there, except for Bill Joy and myself, used the last couple of years as a model for the next 50 years, and came up with very tame predictions. I think you could have asked them about 500 years and you would have gotten the same predictions. These animals ate ravenously and remained slim and it wasn’t a fake slimness. They got the benefit of caloric restriction without the restriction, they didn’t get heart disease, they didn’t get diabetes, and they lived 20 percent longer. There are a number of pharmaceutical companies rushing to bring fat insulin receptor gene inhibitors to the human market; we’ll have that in five to ten years (it would be even less if it wasn’t for the FDA) and not 50 years. We are doubling the paradigm shift rate every decade. That means the next 50 years will have 32 times, approximately, the number of paradigm shifts we’ve seen in the last 50 years. These are all log charts. As you go up a chart it represents multiplying some key feature, some key measurements, by factors of ten. A straight line on a log chart is exponential growth. 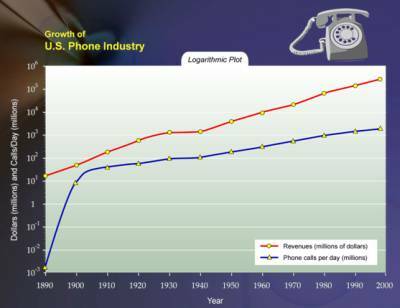 Telephones took 50 years to be adopted by a mass audience, a quarter of the U.S. population. Cell phones did that in seven years. These early communication technologies- telephone, radio, and television- took decades to be adopted. 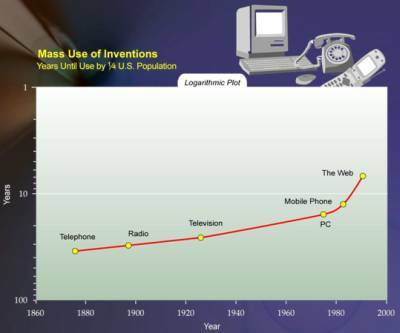 The cell phone, the PC, the Web, is measured in a few years time, and that acceleration has continued. Search engines were not used five or six years ago; the word blog wasn’t used three years ago; ‘social network’ wasn’t used two years ago. The pace of the paradigm shift continues to accelerate. I have a whole theory, which I don’t want to spend a lot of time on, that an evolutionary process inherently accelerates because it basically creates a capability and uses that capability to evolve the next stage. You can even see that when we simulate evolution in genetic algorithms on the computer. 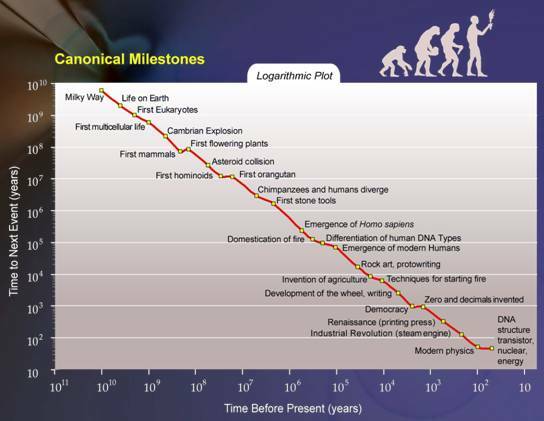 This is a double log chart; with the number of years ago that this event took place on the X axis, and how long the paradigm shift took to take place until the next paradigm shift on the Y axis. 1. United Therapeutics - a biotechnology company focused on the development and commercialization of unique products for patients with chronic and life-threatening cardiovascular, cancer and infectious diseases. In these segments, United Therapeutics is actively developing four technology platforms: Prostacyclin Analogs, Immunotherapeutic Monoclonal Antibodies, Glycobiology, and Telemedicine. development was halted in 2006 when phase III studies showed excessive mortality in the treatment group receiving a combination of atorvastatin and the study group. a full understanding of the enormous scientific potential represented by intelligent machines as well as their equally profound philosophic, economic, and social implications. 4. Novamente - Novamente supplies software products and services to power intelligent virtual agents for computer games and simulations. 5. ARPANET - developed by DARPA of the United States Department of Defense, was the world's first operational packet switching network, and the predecessor of the global Internet. 6. Proteome Project - The Human Proteome Folding project will provide scientists with data that predicts the shape of a very large number of human proteins. These predictions will give scientists the clues they need to identify the biological functions of individual proteins within the human body. for information transfer in living material."